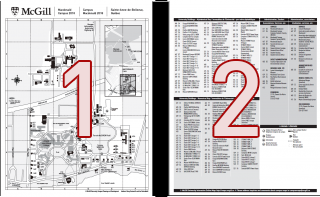 Below are listed all of the publically available maps produced annually by the Campus Planning and Development Office (CPDO). LEGEND INFO: Building names and numbers; footpaths and transportation;Faculties; security and onsite information; locations of:Administration, Student Associations, Services,etc. LEGEND INFO: Building names and numbers; footpaths and transportation; Faculties; security and onsite information; locations of: Administration, Student Associations, Services, etc.